The redevelopment of Chicago Union Station (210 South Canal Street) continues to chug along (see what we did there?) and the next step in the process is a public meeting to go over the most recent plans for the 93-year-old transportation hub. It was just about a year ago that Amtrak tapped neighbor Riverside Development to turn the aging, but vital, piece of the city’s infrastructure into something more than it is, and something better than its builders could have imagined. The result will be a glass skyscraper perched on top of each of the building’s north and south flanks, with 404 residences in one, and 330 hotel rooms in the other. In addition, the plan calls for a big office tower across the street, in the space currently inhabited by Amtrak’s parking garage. This is something of a departure from the previous version of the plan, which called for three office towers on that block. But that was before the CTA turned the northern portion’s surface parking lot into a multi-model transit center. Adopt, adapt, and improve. It’s unclear if replacing three office towers with a single office tower means the new building will be taller. If you want to be among the first to see what’s on offer, head over to the Burlington Room at Union station tonight at 6:00pm. 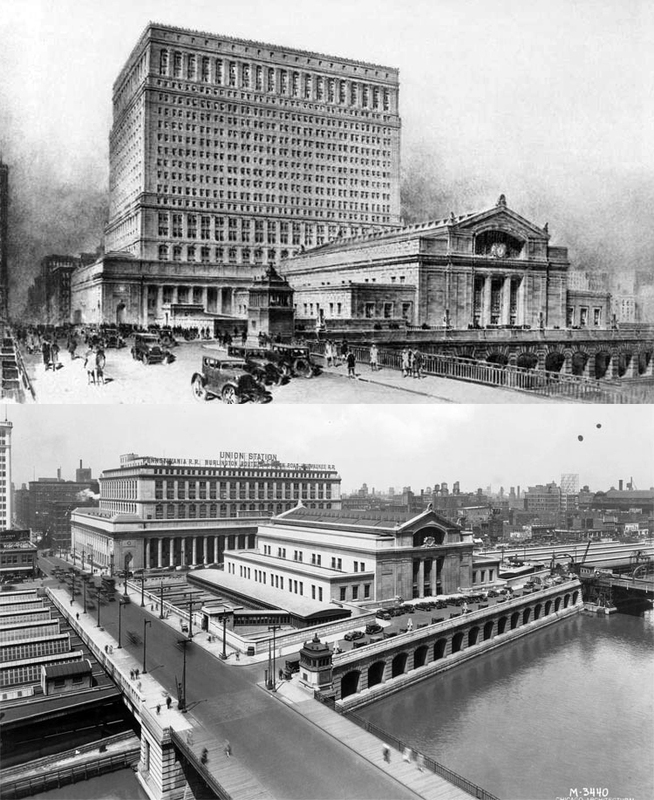 High-rise towers over the west building were contemplated in the original Union Station design in the 1920’s; but I wish that the current proposal were a bit more sensitive to the existing station’s architecture. …and the new proposal unveiled a couple of days ago is even worse than the one in the 2017 rendering. Here’s a rendering of the Union Station high-rise as originally proposed in the 1920’s. I don’t claim that this could or should be built a century later, but it might at least guide thinking about the proportions and general effect of any new structure.